Thurgarton celebrated the coronation of Edward VII on the 9th August 1902 with a garden party, organised by Bishop George Ridding, the first Bishop of Southwell, who lived at Thurgarton Priory. This photograph was taken on the edge of the cricket ground and the cameraman must have stood in one of the upstairs windows of the Priory. 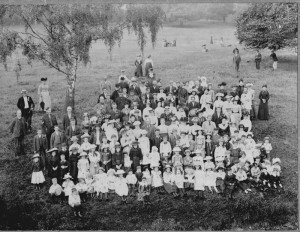 The crowd of nearly 200 represents over half the village population and not surprisingly there was a strong turn out by the village children. All wore their best clothes with a few in uniform – close inspection reveals the village constable, a soldier and standing somewhat apart on the far left are the Bishop’s chaplain (Rev. A.L. Bax), the Bishop’s butler (Mr Heath) and his housekeeper (Mrs Mials).